Mount Gambier, Australia, is the second biggest city in the state of South Australia with a population of around 30,000 people. It is a convenient stop if you are driving along the Great Ocean Road between Adelaide and Melbourne, which is how I first came to visit Mount Gambier about fifteen years ago. Back then it was just an overnight stop and I didn’t really think about things to do in Mount Gambier. More recently I came across an article in a local newspaper about ghost mushrooms in the forest near Mount Gambier! I can hear you asking “what in the world are ghost mushrooms?” I thought the same thing, and just had to find out. So we planned a road trip! 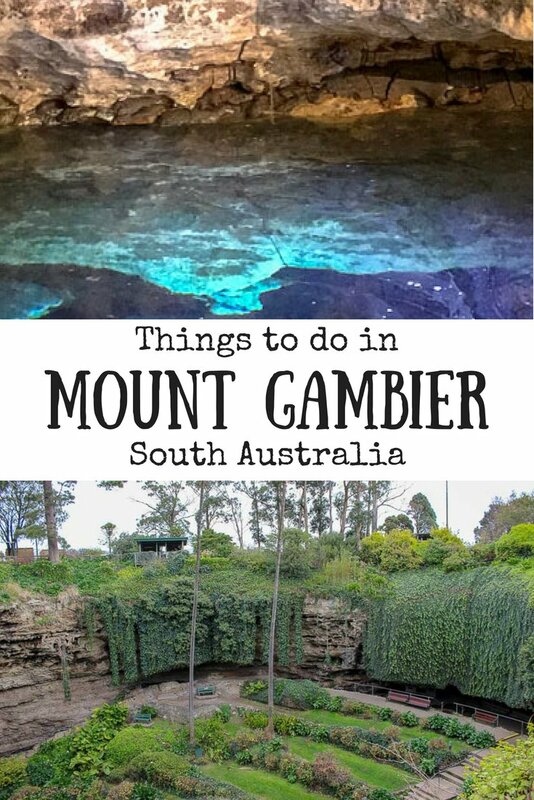 This time I was doing the Adelaide to Mount Gambier drive just to check out the local Mount Gambier sights, not to continue on from Mount Gambier to Melbourne. 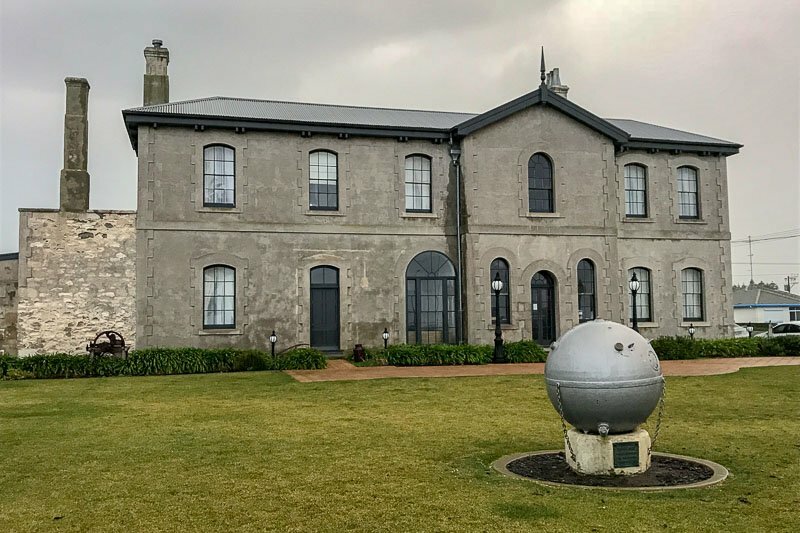 During my research I mostly came across only the same five or six things to see in Mount Gambier, but digging a little deeper I came up with so much more. Here you will find everything I came up with, bundled up in one comprehensive post. Here are places to see in Mount Gambier without leaving the city. These are all accessible by foot from the city centre, but some are a little further than others. The Umpherston Sinkhole is located right in the city centre and is probably the most well known Mount Gambier sinkhole, even though you will find them all over the place. Originally a limestone cave, over the years the roof collapsed leaving just a big hole. Back in 1886, James Umpherston created a garden inside the sinkhole, and over the years it has matured into a beautiful sunken oasis. As cool as that is, the best time to visit is at dusk, when the nocturnal possums come out looking for a meal. We visited twice at different times, first to see the gardens, then later to see the possums. The sinkhole is well lit, making a visit to see the possums in the dark achievable. 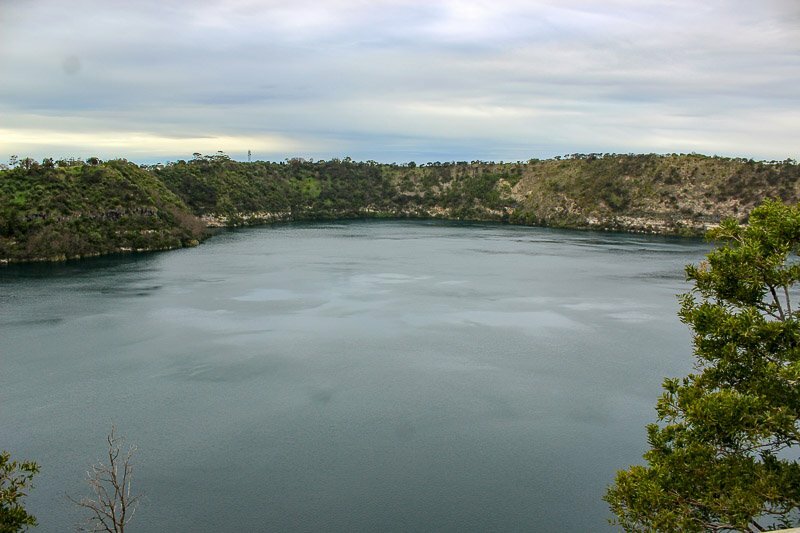 Another of the biggest Mount Gambier tourist attractions is the Blue Lake. We may have visited during the right months for the Ghost Mushrooms, but it was not the right time for the Blue Lake. During the months of December to March, the lake turns a bright, cobalt blue. For the rest of the year, as can be seen from my photo, it is a steel grey. It is not known why this lake changes colour so dramatically, but since it sits in the crater of an ancient volcano, there are probably all sorts of mysteries still to be uncovered. The Blue Lake has multiple viewing platforms and a walking trail encircling it. There are some grassed areas that would be perfect for a picnic overlooking the lake in the warmer months. Inside Engelbrecht Cave. That is one of the tunnels the divers enter to explore further. Like sinkholes, in Mount Gambier caves are everywhere. The Engelbrecht Caves are located right in the city and stretch out under eleven suburban streets. Unlike most other caves in the areas, these are dry caves, so no stalagmites or stalactites. 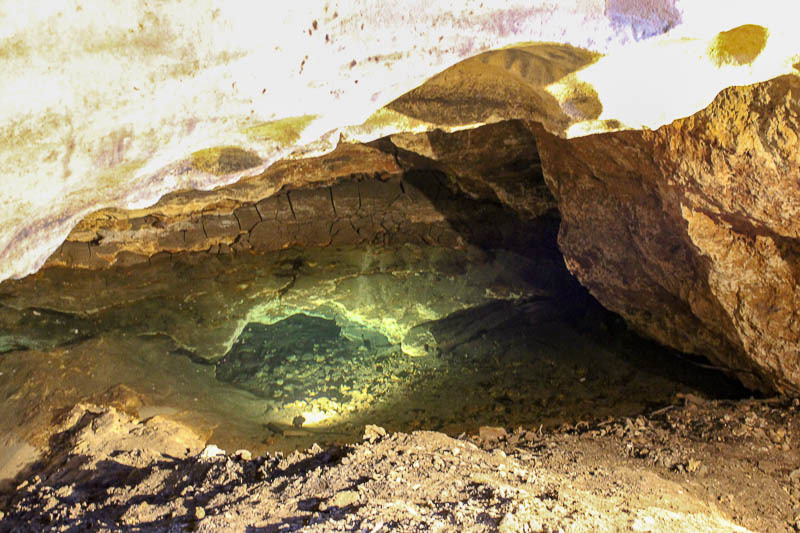 Even though they are called “dry”, in reality most of the caves are actually filled with water, forming lakes. These lakes are a popular cave-diving location for those experienced enough to dive in the claustrophobic passageways (definitely not me!). The tour into the caves is mostly about the history and geographical nature of the caves, with a strong focus on environmental issues that the cave has faced over time and faces now. 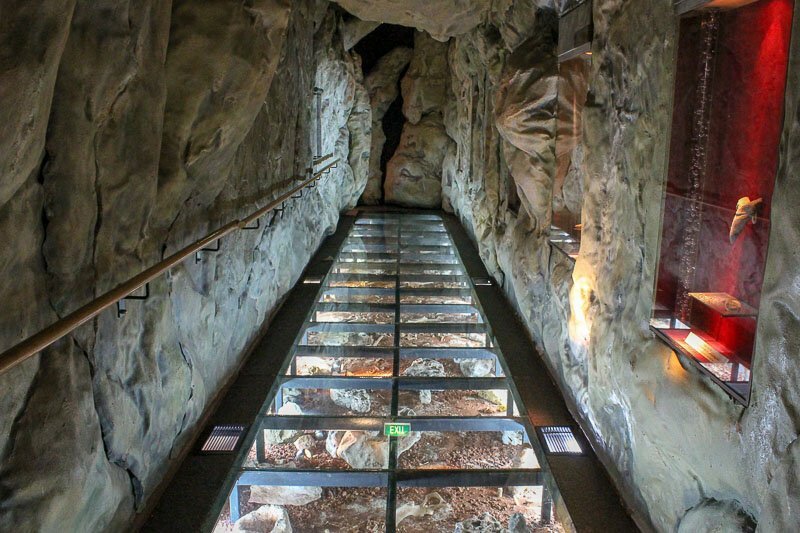 The price of the 45 minute tour for adults is $13.50AUD ($10.30USD) and with various times throughout the year, it’s best to check the Engelbrecht Cave website for times during your stay. 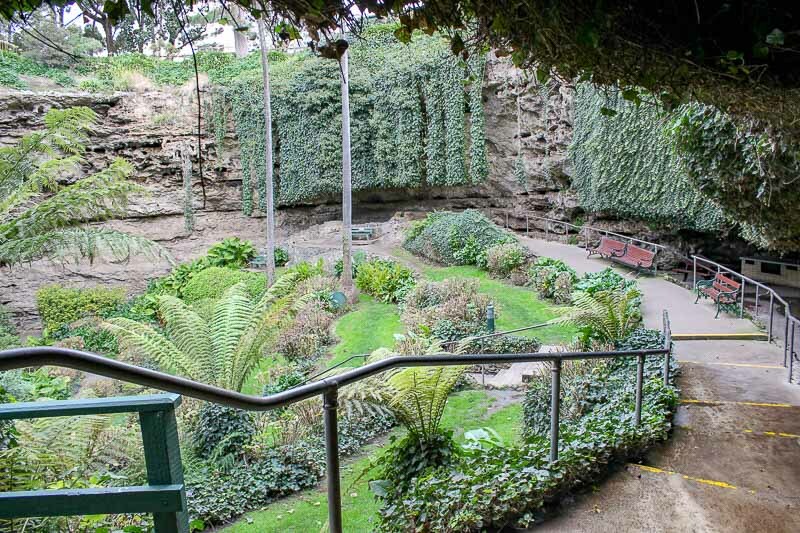 Right on the main street, between the library and the town hall, are the Cave Gardens, another sunken garden in Mount Gambier. The area has lovely gardens, great for relaxing in during the day, and getting some nice photos. We visited the gardens at night because there is a nightly light and sound show held each night at 8:30pm (9pm in summer). Unfortunately nothing happened while we were there, so I think there must have been a technical issue that night since it was confirmed earlier in the day at the visitor centre that it was on. The volcano of Mount Gambier was the first place in South Australia to be named by European settlers. On top of that volcano now sits Centenary Tower, built in 1901. 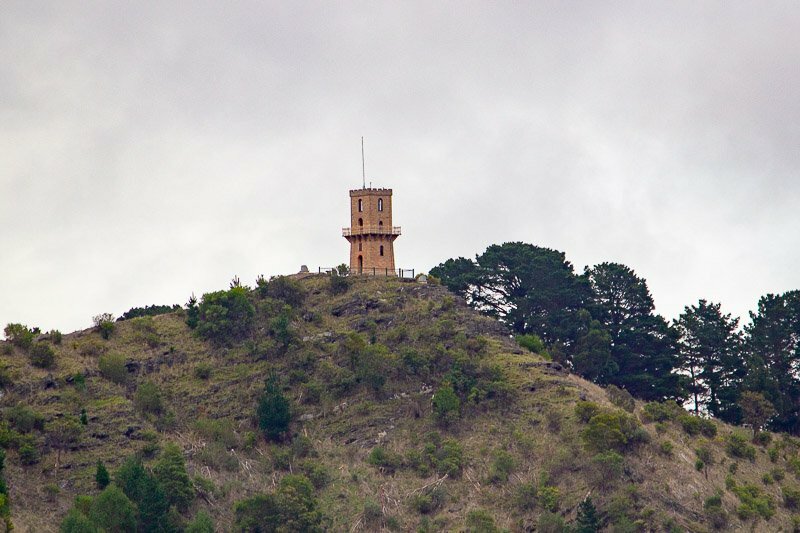 Hiking up to the tower will give you 360 degree views over the city of Mount Gambier and the surrounding countryside. It is possible to go inside the Centenary Tower to get an even better view too. The sign said it was open when the flag was flying for a small admission fee, but there was no flag flying during our visit. Billed as South Australia’s number one regional art gallery. It houses over 1500 items with a large collection of Aboriginal art. It’s not just traditional arts, with many modern art forms displayed too. There are always temporary exhibitions and events going on – while we were in town it was a virtual reality experience about Aboriginal dance. Entry is free, so it’s worth calling in for a quick look. 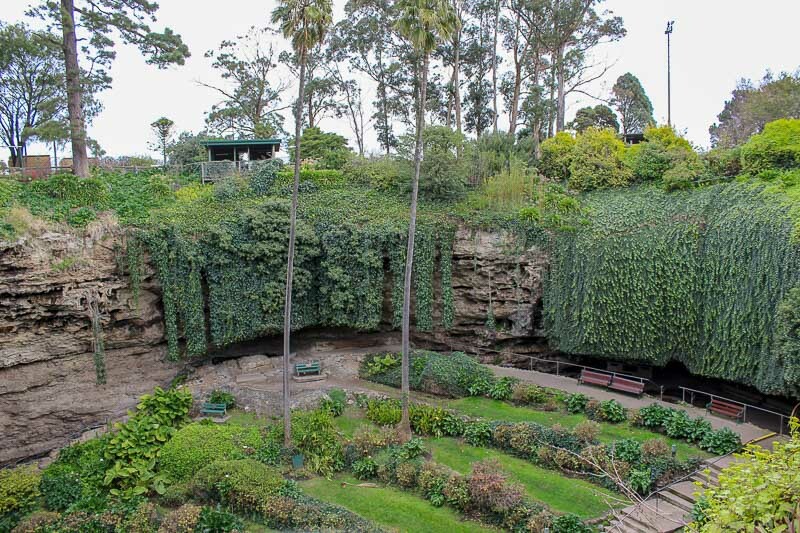 Every Saturday morning from 9am to 12pm the Mount Gambier Farmers Markets are set up at the Cave Gardens. The people running the stalls are all local farmers who are selling fresh, local produce straight from the farm. This is a great little museum to visit if you are a war memorabilia enthusiast, or even if you are keen to see a small slice of Australian history. 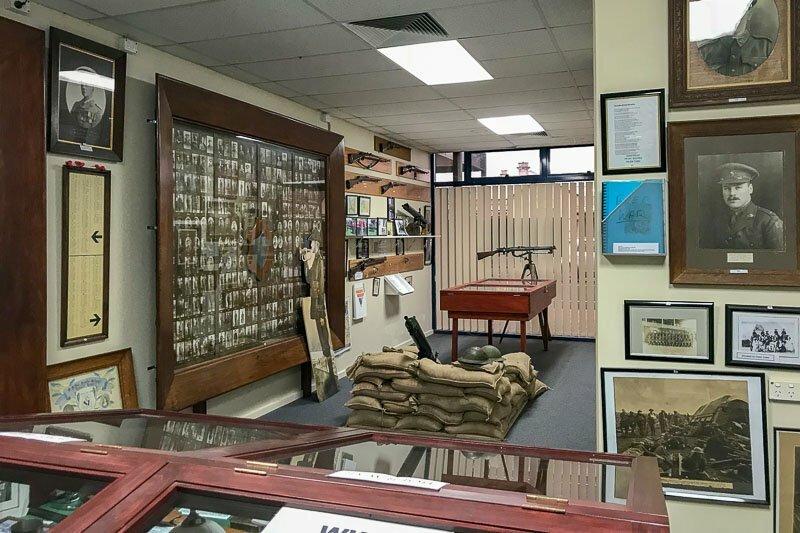 The Mount Gambier RSL have put together a collection which is now displayed in five rooms. Most of the items have been donated by local families. Included in the building is the usual RSL offerings of a bar and restaurant, so you can grab a meal or refreshments before or after you browse the memorabilia. The lime cheesecake I had was delicious. Entry to the museum is free, and opening hours are from 9:30am to 8pm daily. If you are looking for more information on what to do in Mount Gambier then head to the Lady Nelson Visitor Centre. 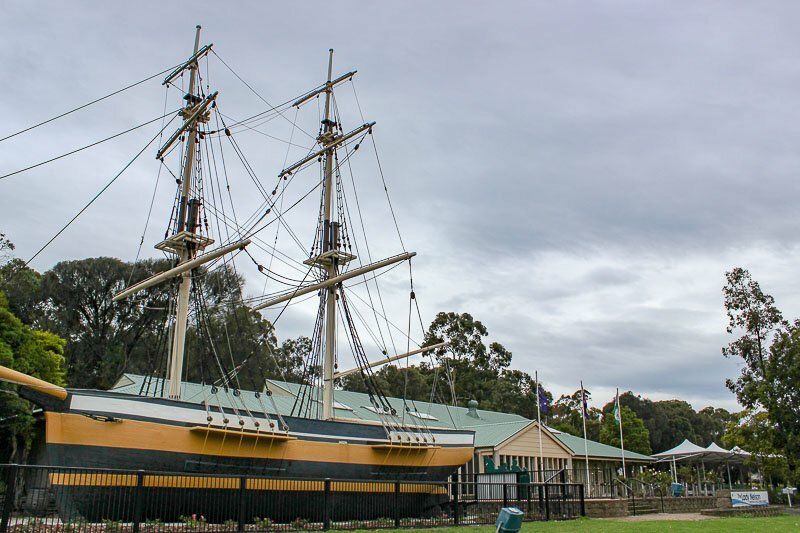 While here, have a look at the full sized replica of the Lady Nelson, the first ship to sail along the coast of South Australia in 1799, then venture into the Discovery Centre, a mini museum about the history of the area and some of the local wildlife. I just loved the area with the glass floor – but be careful of the miner staring down at you from the ceiling. He made my daughter jump because he looked so real peering down at us. In May each year (May 3rd-5th, 2019) Mount Gambier plays host to thousands of Jazz musicians during the Generations in Jazz event. It’s mostly a Jazz competition hotly contested by more than 100 schools Australia wide, but there are also performances by well known musicians. The music is of a very good quality, so if you are a jazz fan, this might be a great time to visit. If you are not a jazz fan, I suggest visiting another weekend, because the town will be overrun with visitors. Another of the Mount Gambier activities is a free movie shown twice a day, 11am and 1pm, at the Main Corner Complex. It is a documentary called Volcanos about the geological history of the area. It also shows many of the local sites such as the Blue Lake and some of the caves and is good background information on them before a visit. It can also help you decide what to see in Mount Gambier during your visit. Not far from the Blue Lake is this lovely park area where you will find some indigenous flora and fauna to observe as you walk through the wetland boardwalks. This is a popular place for the locals who often come here on the weekends to use the barbecue facilities while the kids play on the playgrounds and relax in the natural surroundings. There are a number of nature walks leading to a lookout over the area. The park is accessible for disabled visitors, has toilet facilities and plenty of parking. Best of all, entry to the park is free. These are all things to do within and hour of Mount Gambier. Many of them can be combined to make a great day trip, but are still close enough if you only have time for one or two things. Ghost mushrooms (Omphalotus nidiformis) were the catalyst for this road trip. 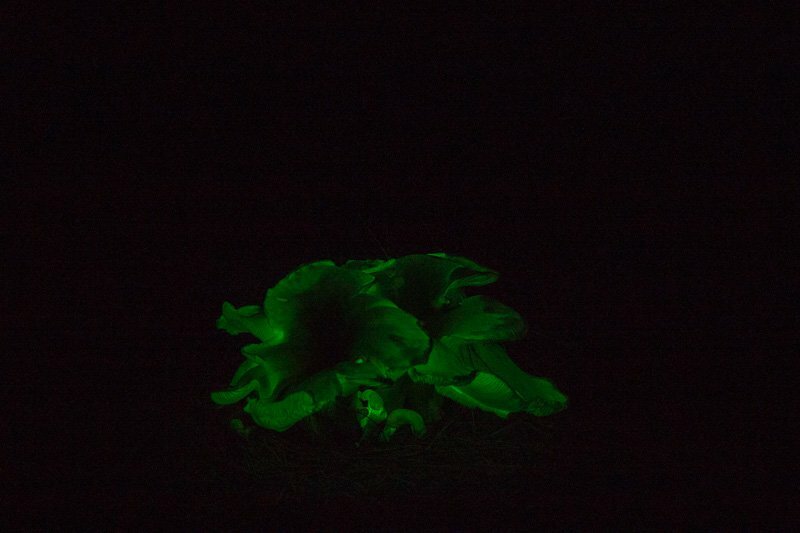 They are glow-in-the-dark mushrooms that are native to Australia and grow in the pine forests of the South East of South Australia. They are predominantly found throughout May and June with the onset of the wet, cold weather, and ForestrySA are now opening up an area to allow the public to visit and view the mushrooms during this time. We visited in the second week of June, and we had a couple of locals comment that the mushrooms were reaching the end of their season, so if you are planning a visit, May might be the best option. Having said that, we saw hundreds, if not thousands, of mushrooms, and while some were certainly beginning to die off, there were still plenty to see. We arrived at Ghost Mushroom Lane, about 15km outside of Mount Gambier, at about 6pm. It was easily dark enough to see the gentle glow of the mushrooms as soon as we made our way into the forest and turned off our headlamps. ForestrySA have pegged out four different areas where visitors are most likely to see mushrooms. Visitors are also encouraged to take markers provided from the buckets near the main paths to flag areas where the mushrooms can be found. we easily spent about ninety minutes looking at the mushrooms. Most of the time was spent trying to use my meagre (non-existent?) photography skills to take a long exposure photo to show off these amazing fungi. I love seeing these sort of strange things in nature, and I really enjoyed the ghost mushrooms. The trip down to see them was worth while, and I think if you are nearby in May or June you will not be disappointed. Head over to the ForestrySA website to read more detail about how to visit. 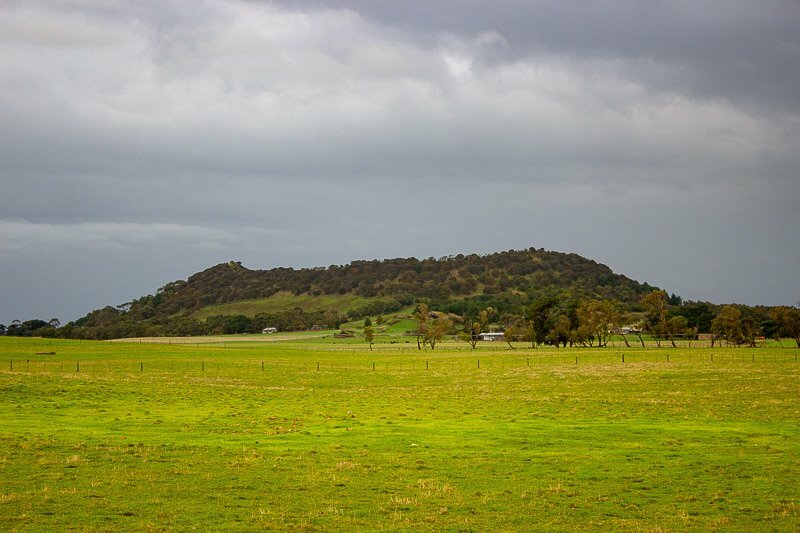 About 15km south of Mount Gambier lies the dormant volcano Mount Schank. It is possible to walk up to the crater rim, look down into the volcano, and to get 360 degree views of the surrounding farm land. It’s a bit under 2km round trip from the carpark, taking about an hour, and is a relatively easy walk. Don’t worry, the volcano last erupted around 5000 years ago and it’s not expected to erupt anytime soon (well, ever really!). The Tantanoola Cave is about 30 minutes drive (23km) from along the Princes Highway towards Robe. It is only a relatively small cave, but has some impressive cave formations such as stalagmites and stalactites. It does have one major selling point though. These are the only caves near Mount Gambier that have wheelchair access, so even those people who can’t deal with many stairs can visit here. Adult entry tickets start from $14AUD. Click here for more information on other ticket prices and opening hours. This German mine washed ashore at Port MacDonnell in 1943. It now sits outside Customs House. There is no Mount Gambier beach, but about thirty kilometres south of Mount Gambier, Port MacDonnell is the next best thing. Known as “Australia’s southern rock lobster capital”, there are plenty of water sports in the summer or fishing year round. Check out the colony of little penguins that live near the town as they come back in from the sea at dusk. There is a Maritime museum here that gives lots of information about the history of the area, and so many parks and reserves with free facilities such as playgrounds and BBQs that even a whole day here may not be enough. The Glencoe Woolshed gives a glimpse into the past as it is still as it was when it was built in 1863. Maintained by the National Trust, the woolshed also displays many items related to the history of the wool industry in this area. Located in the small town of Glencoe about half an hour from Mount Gambier, this could be combined with the Tantanoola Caves above. The entry fee is $6AUD and you will need to call into the Glencoe General Store to pick up the key. In Penola itself call into Penolaraya, a Fantasy Theme Park. It is a colourful hodge podge of displays, including a model railway and some tearooms to enjoy a cup of tea and some scones. All of the displays are under cover, so this is an all weather attraction, accessible in both the hot summer heat and the winter rain. More information can be found on the website here. I have to admit I did not visit Penolaraya during our trip, but it’s an unusual attraction that I thought was worthy of a mention. It might be especially interesting if you are visiting Mount Gambier with kids. Mary MacKillop is Australia’s only Catholic saint. She lived in Penola from the age of 14 and it is here that she made her declaration to God and founded the Australian Sisters of St Joseph order. The visitors centre here contains lot of information on the life of Sister Mary and the history of Catholic education, a resource centre for research, and a gift shop. 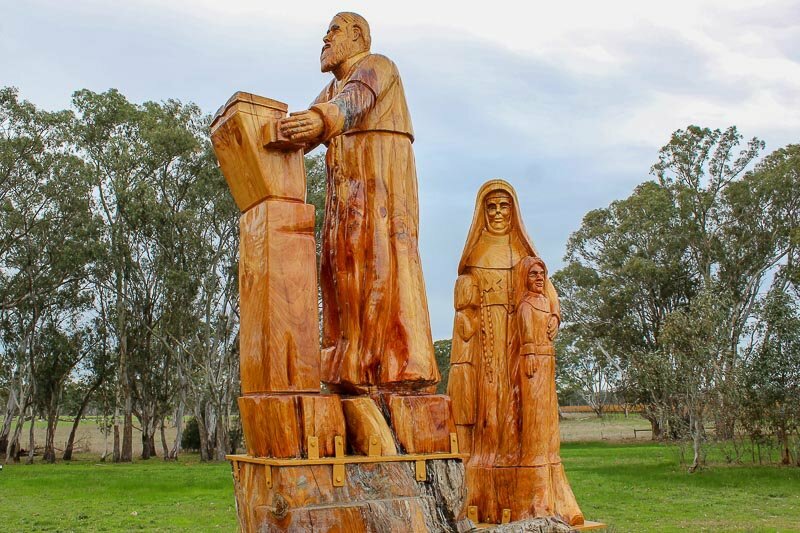 Sister Mary’s mentor, Father Wood enjoyed wood carving, and as you drive from Penola to Coonawarra there is a small park on the roadside showing off some of his creations. One of the many Coonawarra wineries showing off the colours of winter in this region. The Coonawarra is one of South Australia’s premier wine regions. 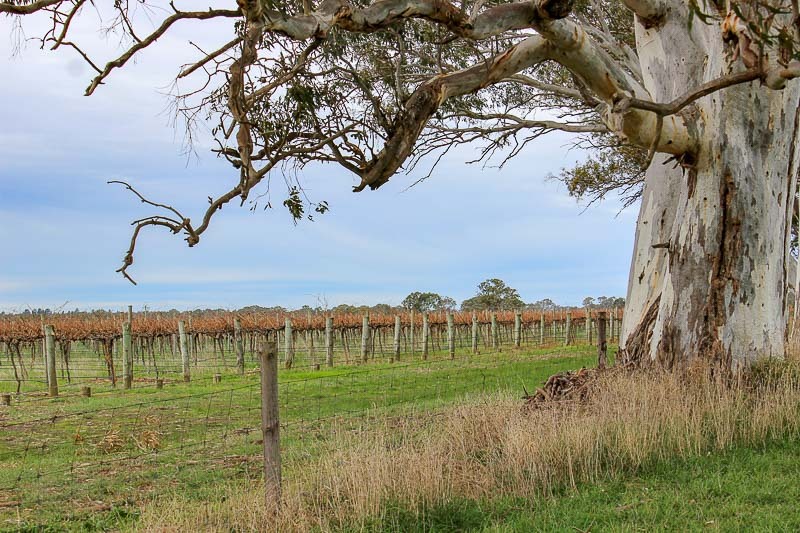 Located about ten kilometres from Penola, it is most well known for it’s cabernet and shiraz varieties. Currently home to more than 25 wineries, there are plenty of cellar doors here with tastings available. 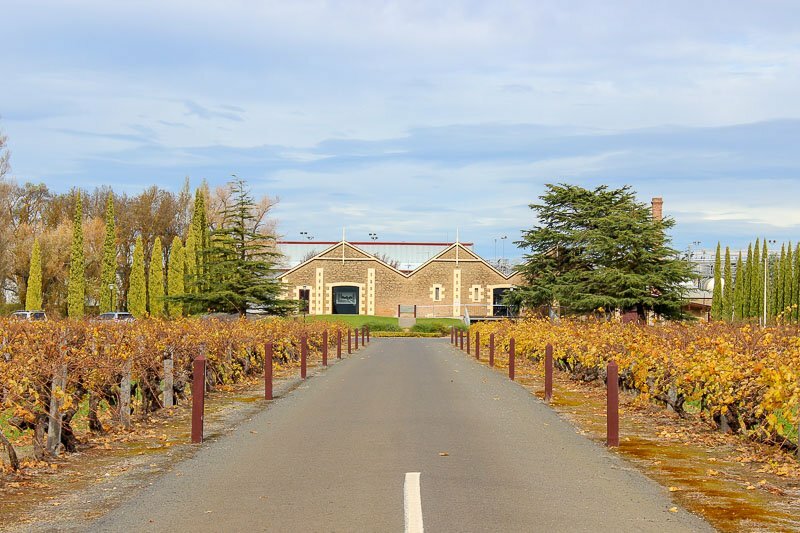 While some, such as Wynns Coonawarra Estate or Leconfield Wines, are well known, there are many other smaller family wineries that are also producing top quality wines that are being exported world wide. We visited Mount Gambier from Adelaide. There are two different routes to take. On the way down we went via the inland Dukes Highway and Riddoch Highway, through Keith, Naracoorte and Penola. One the way back to Adelaide we took the coastal road through Beachport, Robe and Kingston. 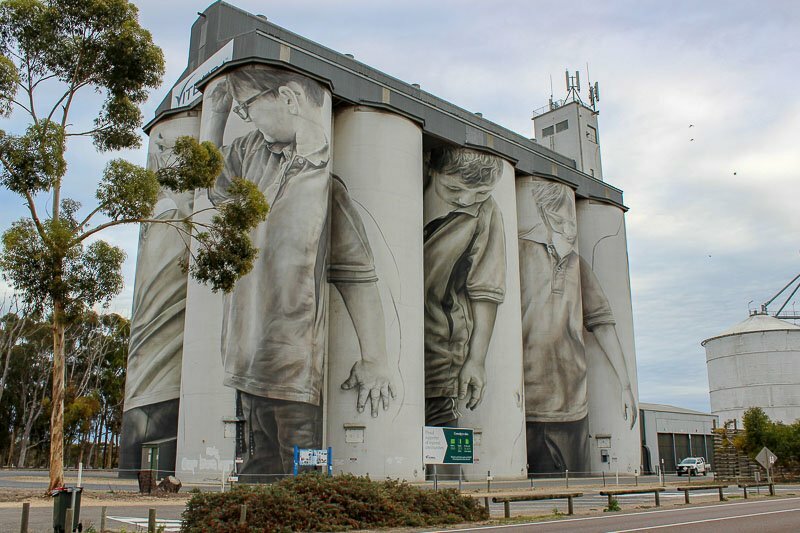 Found in Coonalpyn, this fantastic silo art is worth a look. At almost two hours into the drive, this is the perfect place to stop and stretch your legs for a few minutes. Grab some refreshments from the local store while you are passing through. 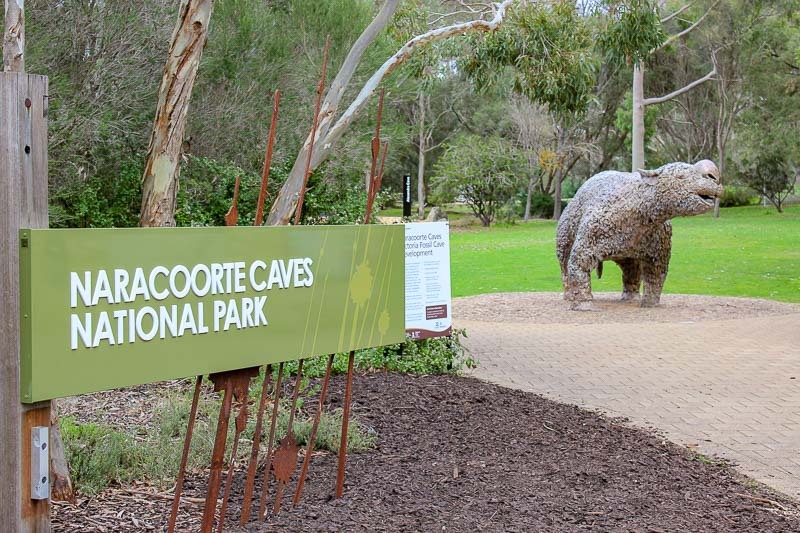 Located just south of the town of Naracoorte, the Naracoorte Caves are South Australia’s only World Heritage site thanks to the fossils that have been found here. There are 28 known caves in the national park, but only four of them are accessible to the public. Most people will just come here to do one of the many easy tours each day, but there are also options to do some more adventurous caving too. After visiting the caves, there are BBQs and picnic tables here for an easy lunch, or visit the cafe for a meal. Visit the Naracoorte Caves website to check tour times and prices and for more information. 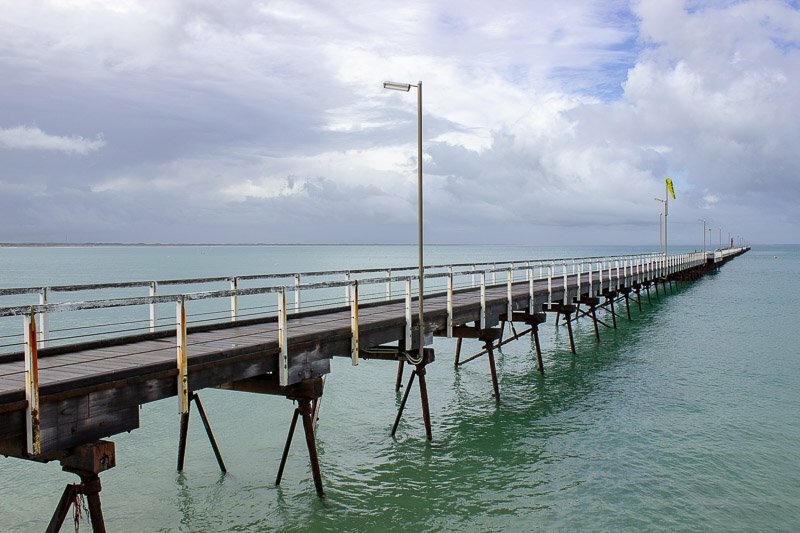 Walking the length of the Beachport Jetty will be a good break during your drive. About 85km from Mount Gambier along the coastal route is Beachport, a typical little Australian coastal town. Beachport’s claim to fame is that it is the location of the first WWII casualty on Australian soil when a mine was towed ashore and two unfortunate fishermen happened to be in the vicinity when it exploded. If you visit in winter you will notice it’s sleepy nature, with a few locals out and about, perhaps fishing or strolling along the Main Street. If you come here over the summer holidays it will be like a different town full of visitors from Adelaide taking advantage of the pristine waters and unhurried lifestyle. There are some beautiful coastal walks with some interesting artworks popping up – such as a flip flop tree! Further up the coast towards Adelaide is possibly the most popular beach holiday destination for people from Adelaide. Robe is one of the oldest towns in South Australia and as such has quite a few heritage listed buildings. Visit the stone obelisk that helped guide ships into port until a lighthouse was eventually installed, then relax on the beach or check out the local craft brewery or one of the many wineries in the area. The Big Lobster in Kingston. We Australians love our big “things”. I have no idea why, but they are everywhere. 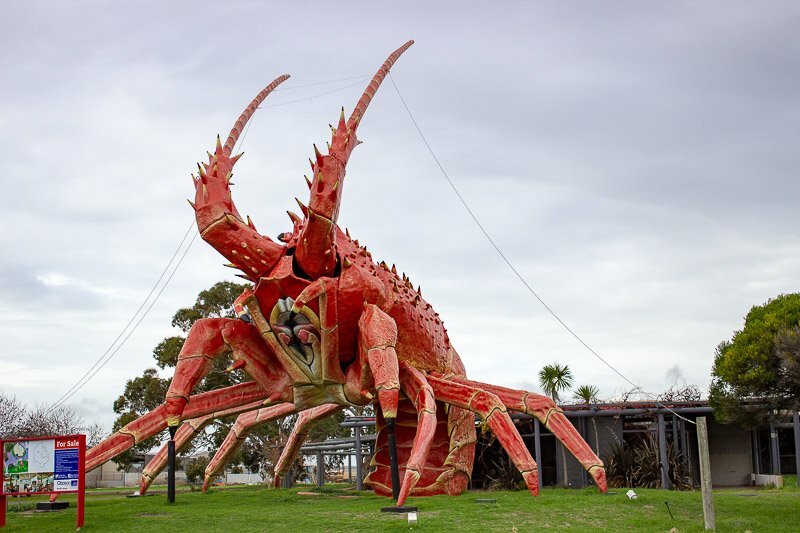 In Kingston we have the Big Lobster. Unfortunately he is falling a little into disrepair as the current owners have closed the restaurant and put him up for sale. Right next door you will find another quirky Australian attraction, the Tractor museum. This mostly looks like a tractor graveyard, but there is a building full of bits and pieces too. It was closed as we passed, so I didn’t get to look inside. 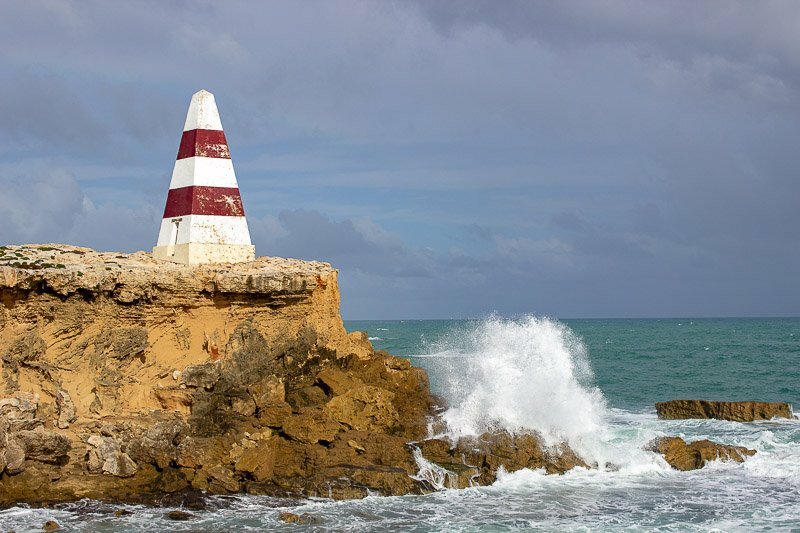 While in Kingston check out the Cape Jaffa lighthouse, moved here from it’s original location on a reef 8km out to sea. If you are travelling in summer, head straight across the road from the lighthouse to have a swim or dip your toes into the ocean along yet another pristine South Australian beach. There are many different accommodation options in Mount Gambier. Here are just a few of them to help you with your choice. The entrance to the Old Mount Gambier Gaol is still the same as it has been for years. This was our choice of accommodation and we were not disappointed. 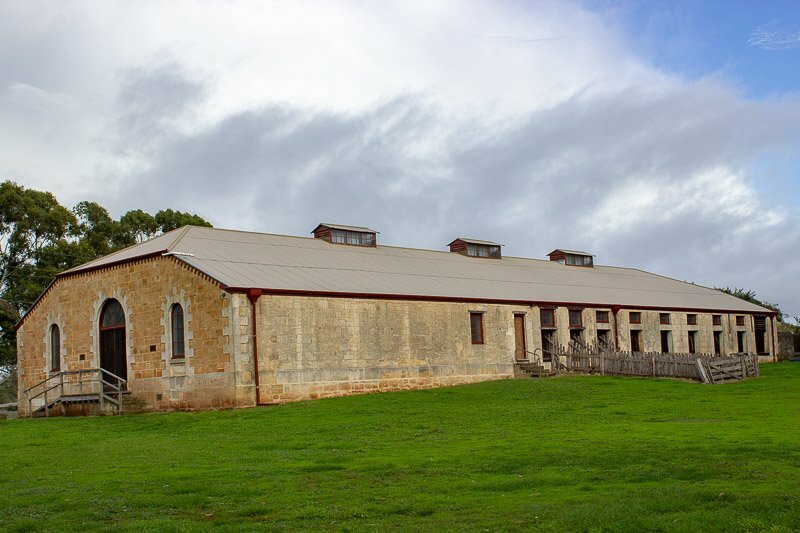 The Old Mount Gambier Gaol is a fantastic, family run, budget accomodation option. Rooms vary from a private three bedroom cottage to dorm rooms with shared bathrooms. We stayed in the latter, and it was warm and comfortable with everything we needed. The owner, James, was fantastic at providing us local information and he is truely passionate about the gaol and looking after his visitors. 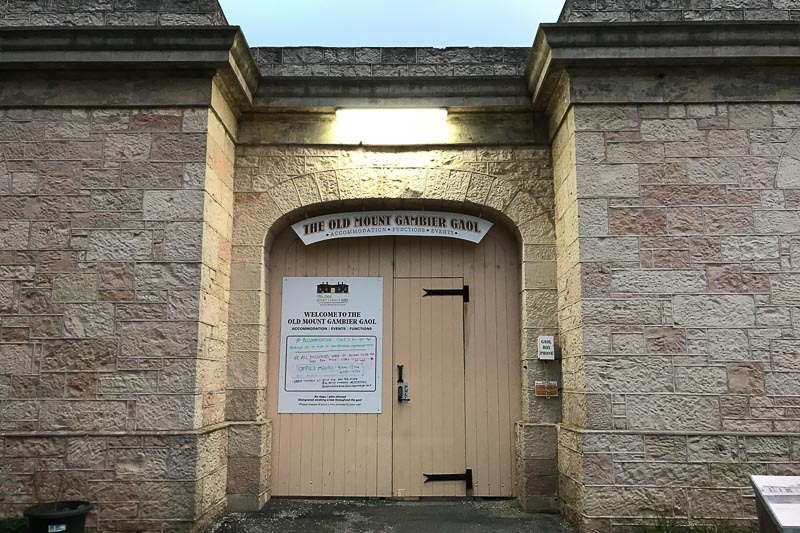 Once a year, in January, the Old Mount Gambier Gaol is the location of the Red Hot Summer Tour, a music festival headlined by some of Australia’s best rock acts. I can honestly recommend this place if you are looking for unique, budget accommodation with a warm and welcoming atmosphere. For a little more luxury consider staying at possibly the best place in Mount Gambier, The Barn. Located slightly outside the city on a large property with beautifully manicured gardens, The Barn features accommodation ranging from standard queen rooms, to king spa suites and even a stand-alone four bedroom house. It has an acclaimed restaurant on site and is a sort after venue for weddings. If a central location is important then consider the Mid City Motel. You will be walking distance to the centre of town and many shops and good pubs and restaurants. Rooms range from standard motel rooms to two bedroom family rooms. There is free parking on site and a barbecue area available for guest use. The Lakes Resort Mount Gambier is situated slightly out of the city centre on the side of a hill giving nice views back across the city. Best suited to couples, the majority of the rooms are double rooms, or for added luxury there are king rooms with a spa. There is a swimming pool on site making this a popular choice for summer and it is walking distance to the Blue Lake, one of the most popular places to visit in Mount Gambier. 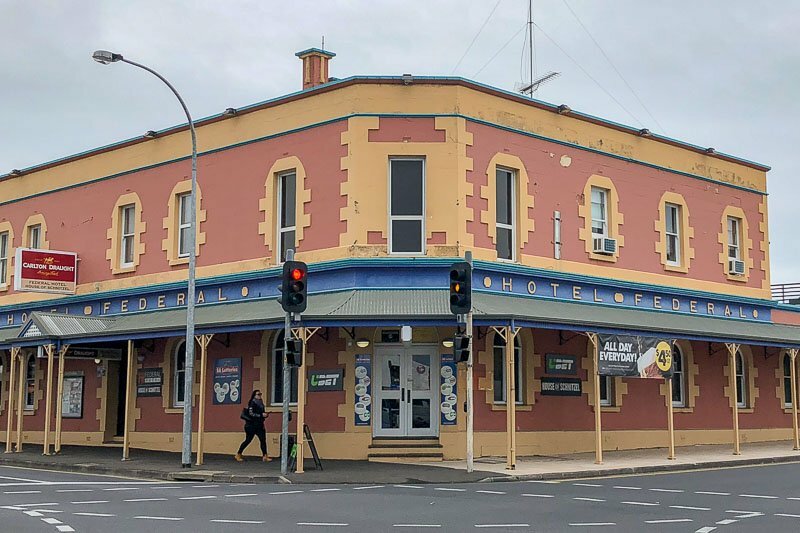 This popular Mount Gambier hotel is housed in a beautiful 19th century building and a stay here will be like stepping back in time. It has been recently renovated and has a range of accommodation from budget to premium. It is located in the centre of town, and has a restaurant, sports bar gaming room and beer garden on-site. For B&B style accommodation give Colhurst House a try for that “feels like home” experience. It has nicely decorated, well appointed rooms with hot tubs and can accommodate up to four people so children are welcome. A full English breakfast is available daily. If you are travelling with a caravan and looking for a Mount Gambier caravan park you will be spoilt for choice as there are a few in town. I suggest trying the Blue Lake Holiday Park, located just across the road from the Blue Lake. Not only do they have powered and non-powered sites, they are pet friendly and also provide varied accommodation in cabins and bungalows. There is a swimming pool and playground on site too. Mount Gambier has a wide range of options when you are looking for places to eat. You will find all the common fast food chains in town, plenty of cafes and pubs, and some great restaurants too. Here are just some suggestions. The Federal Hotel is a typical Australian pub. The restaurant is one of the locations of The House of Schnitzel. One of Australia’s favourite meals, the basic pub schnitty is done well here with a wide variety of options. Served with a salad bar, these are solid value for money meals with lunch each day also having two for one deals. Have a look at the menu and their other specials on their website here. Do you need somewhere with space for your bikes or pram? Do you have a pet with you? Or just need to access to wifi to plan the rest of the afternoon? The Bookmark Cafe is just the place. Located at the Mount Gambier Library and overlooking the Cave Gardens, it is open for breakfast and lunch each day. Meals include assorted hot and cold options, with great coffee and delicious cakes and slices. I mentioned the accommodation at The Barn above, and they also provide a well respected restaurant too. You do not have to be staying here to experience the beautiful aged steaks served up here. This is not a budget option, but you will fine meals prepared using top quality local products. The cellar is also stocked with great wines, most of them coming from the local Coonawarra region, which produce fantastic Cabernet Sauvignons that are perfect companions to the steaks. Browse their menu here. Just looking for dessert or an afternoon coffee and cake? The Metro Bakery and Cafe offers breakfast, lunch and dinner and also everything in between. With all baked goods made on site daily, they pride themselves in the freshness and quality of their products. Open until 11pm on Thursday, Friday and Saturday nights, this is also the perfect late night coffee location. See the menu here. This Asian fusion restaurant is small but packs a punch with it’s delicious options. It’s also popular for takeaway if you are just passing by. It doesn’t focus on any one Asian cuisine, but rather has a mix of flavours available from many of them. They are open for lunch and dinner every day except Mondays. Prices are reasonable with some $10.90AUD lunch specials. They also have a BYO alcohol license allowing you to bring along that bottle of wine you picked up earlier during your wine tour. Click here for the menu. 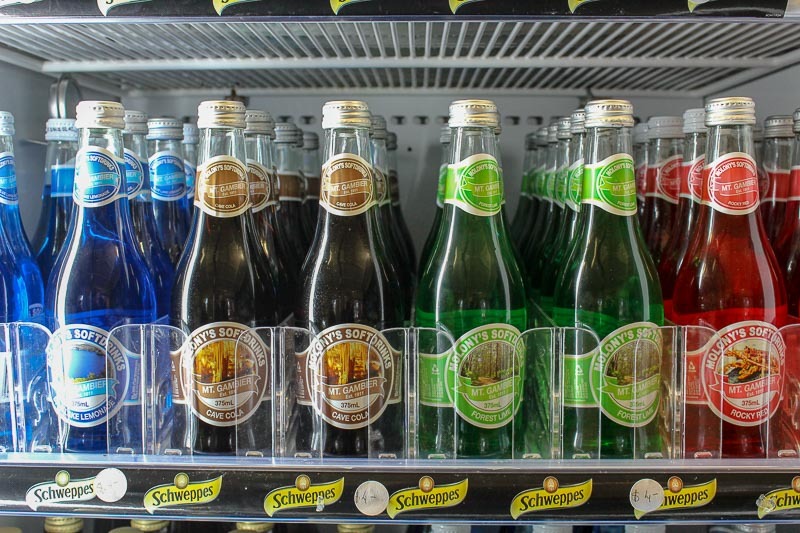 Try some of the locally made soft drinks. The Blue Lake Lemonade will turn your mouth blue – reminiscent of the lake it’s named after. Regional Express airlines has two or three flights a day from both Adelaide and Mount Gambier to Mount Gambier. Visit their website to see schedules and prices. Mount Gambier airport is located about 10km north of the city centre. Hire cars are available from the airport, or you can reach the city centre by taxi. From Melbourne – It’s possible to catch a bus from Melbourne to Mount Gambier but the schedule means an overnight stop in Ballarat, so this is not an ideal solution. Click here to see options. From Adelaide – while probably not a great option, if you are looking at trying to catch a train fron Adelaide, it will take you as far as Bordertown and you will have to swap to a bus from there. The whole trip will take over eight hours, and the train only runs twice a week. From Melbourne – again a train/bus option is required, but this would be preferred over the bus from Melbourne as it only takes about 6.5 hours if the route is through Ballarat. There is an alternative route through Warnanbool too. Train schedules and prices can be found here. From Adelaide – the distance from Adelaide to Mount Gambier is about 435km taking the inland route of Riddoch and Dukes Highways. It is all on good roads and the Adelaide to Mount Gambier drive will take around 5 hours with only short breaks included. From Melbourne – the Melbourne to Mount Gambier drive is almost exactly the same at 440km, going via Geelong. It may take slightly longer than the drive from Adelaide, while the distance from Melbourne to Mount Gambier is similar, the roads go through some more hilly, therefore slower, sections. You will likely need a car to get around Mount Gambier and surrounds. There are many hire car companies, mostly located at the airport. Taxi’s are available in Mount Gambier, but Uber is not. In summer the temperatures are likely to be from 26 – 32 degrees Celcius, with sunny days and light winds. You would be unlucky to have rain, with it only expected on two or three days a month during summer. 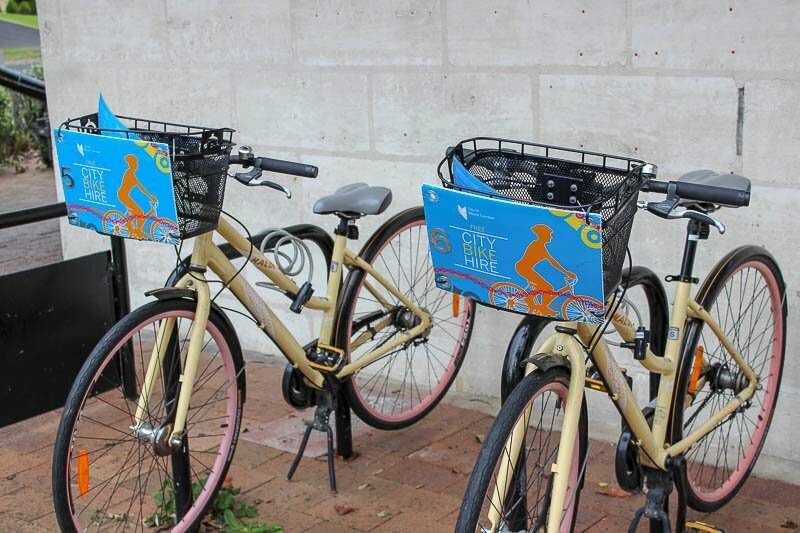 As South Australia’s second city it is possible to find almost everything you could want here in Mount Gambier. Many of the common chain stores have outlets here as this is the retail hub for a large county area. Most businesses trade Monday to Friday from 9am to 5pm. Some of the bigger shops and supermarkets will have extended trading times and will also open on the weekends. To learn more about what is on in Mount Gambier during your visit call in to the Lady Melson Visitor & Discovery Centre. The staff are more than happy to tell you about anything that is going on in town, as well as give you any other information you would like. This really is your one stop shop to all you want to know about Mount Gambier. Wow this is a really great thorough post! I like to do this kind of research when going from place to place myself, to break up the long drive. You saved a lot of people the trouble 🙂 So many neat things to check out..and those ghost mushrooms, I never heard of them before. Will definitely have to check them out when I get to Australia! Thanks Maura! Many other people here in South Australia haven’t heard of the ghost mushrooms either, and they have been right on our doorsteps forever! Do go have a look if you are in the area in May/June. Thank you! My state – South Australia – is oven missed by visitors to Australia, but there is so much to offer here if people can find the time to come. Love this! Makes me realize again that I haven’t covered at least 0.01 percent during my 2-week visit last year. Ugh! Can’t get enough of province vibes, really. Thanks Taru. I hope you are able to visit soon. Thanks Mikayla. We are very lucky to have stunning views around almost every corner – but then again, so much of the world does if we look hard enough. It’s an amazing place. So many great things to see! Australia is so on my bucket list! I haven’t been to Australia but my husband’s uncle lives there so I hope to one day. This gives us lots of ideas to do when we go. A really detailed and informative post. I love the idea of the ghost mushrooms! The ghost mushrooms and so unique. It was exciting to see something not many people – even local South Australians – have even heard of.